Welcome to our #AFtalks recap! Do you monetize with video ads, or have been thinking about it? 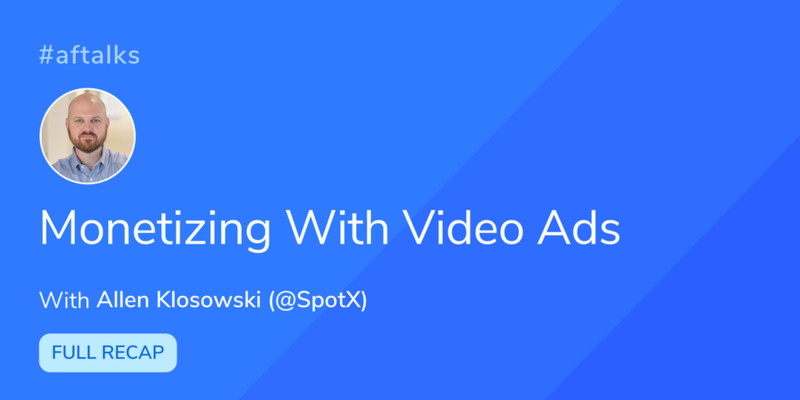 This week we caught up with our friends at SpotX to learn more about video ads, SDKs, and the pros/cons of using this format to make money with your apps. Q1: How are video ads different than other formats (native, banner, etc.)? A: Complete with the trifecta of sight, sound and motion, video is an inherently engaging format and an excellent tool for driving brand awareness and retention. For example, other formats focus heavily on cost-per-install, wherein video, you get ads from big consumer brands. Another great thing about video ads is they tend to have different advertisers behind them than display ads do, which opens up new revenue for developers. However, video creatives are “heavier” than display ads and success measures are distinct, so it’s important to design your app with video in mind if you plan to use it to monetize. We think 6-15 sec is perfect for a mobile environment, although many advertisers still do 30 secs. Q2: What are the best benchmarks for video ads that developers should/could establish to determine success? A: Performance benchmarks vary depending on the type of ad. Ads that prompt click-throughs earn nearly 2% CTR, while ads with custom interactive built-in earn double that in terms of measurable engagement. This stands in contrast to display ads, which have an average CTR of just 0.05%. Completed View Rate is an important metric in video ads, and mobile video formats average CVR of nearly 70%. Developers must think about designing experiences that work for both the user and the advertisers. Brands want engagement and that can be measured by completed views or by click-throughs depending on campaign goals. Developers should pay attention to user retention when video ads are shown as well, so placement of where the ad occurs is critical. Looking at overall monetization yield, or the amount a developer can earn, it’s usually much higher with video if done right. Q3: What types of apps can benefit most from monetizing with video ads? A: Certainly all apps can use a video strategy, but it’s more natural for some types of apps than others. This depends on the type of ad in question. Video ads in mobile apps can be effective for broad branding campaigns, but also when the measure of performance is cost-per-action or cost-per-install. Apps with video content benefit the most from branding video ads – these are ads from major advertisers including auto manufacturers, consumer goods, retail, etc. Branded ads get paid out on the number of ads viewed, and are well-suited to environments where the ads are part of the content – think live sports, linear video, or VOD style libraries. However, these environments tend not to be clickable. Apps oriented around gaming or other entertainment are a good fit for video advertising that has CPI/CPA goals, typically shorter videos with calls to action that drive downloads. This is because interstitial ads can be run within the user journey—for instance, between levels of a game. These ads can also be clickable, a feature not often available in long-form mid-roll placements. Apps that can reward the user for watching them. Incentivized video is really a great win-win. Games often take the best advantage of this – watch a video ad to get more lives – but I think there's potential for other content-gated apps. We totally agree, this also leads to other types of videos such as in-feed and native placements you see in endless scroll environments. Q4: What can developers optimize when leveraging video ads for monetization? A: There are two parts to this- what can be done for users and what is important for brands/advertisers. For users- they need the video ads to load quickly, an inherent advantage of apps, so make sure to preload ads! They also need the ad content to be relevent, so make sure to choose a platform that can personalize ads to the user(s) needs. Viewability! They want to make sure their ad was actually seen. Try an SDK that includes Moat. A/B test skippability: adding skip buttons at 3,7, and 15 seconds to see which delivers the best balance between user experience and completed view rates. Don’t be stingy on passing data to buyers. If you’re not transparently passing Apple IDFA, Google Ad ID or Bundle IDs with your bid requests, many buyers won’t be able to transact on your inventory. Think ahead about how you’re going to sell the ads. Do you have a sales team? If not, definitely consider programmatic to allow you to efficiently sell your inventory. For instance, the SpotX platform executes a parallel ad call for each ad opportunity so all demand sources are completed simultaneously, the impression is sold to the highest bidder and publisher earnings are maximized. Q5: At what stage of development should developers start thinking about integrating ads? A: At the beginning, consider whether you’re to be ad-supported or subscription-based. This can help inform the way you design your app. You need to design your experience to support video. This means that, in our opinion, monetization strategy should be the initial planning stage because it defines how the ads are implemented in the user journey. If your company is very small, then you are looking at “open market” revenue from buyers, and that requires a strategy as well. If your company is midsize, with lots of users but no ad sales, consider a partner that can handle that for you. Also, getting ads is more than just installing an SDK. Again, is your company big enough to have a sales team – if so that needs to factor in. Many developers focus on getting as many users as they can without a revenue model behind it. This can be a misstep. If there is a logical place for a video ad, then you can start to work that in to your existing placement, but at a CPM higher than display. Q6: What are some common misconceptions behind monetizing with video ads? A: A major one is that “Video is too disruptive”. False. Video can be a native part of a content experience, so long as the content is appropriate. The idea that video ads are too disruptive come from developers that shoehorn a video experience in where it doesn’t belong. If you are looking at video apps – live video feeds or video-on-demand apps – it’s a perfect combo, but works w/ gaming, social, utility too. Good question, it's often hard to have hard/fast rules on what is appropriate, but if it feels forced or disruptive then it definitely is. 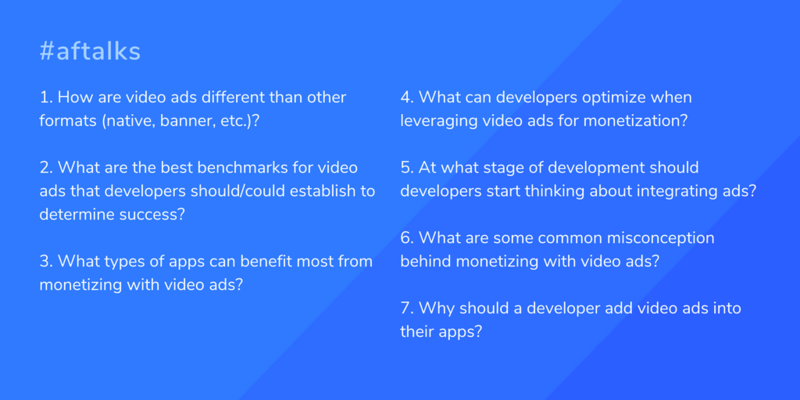 Q7: Why should a developer add video ads into their apps? What is the value of the mobile app environment for video advertising? A: The mobile app environment is inherently interactive making it an enticing opportunity for advertisers to leverage interactive creative. Video in the mobile app environment provides a smooth user experience, lending itself well to high engagement and interactivity from users. Millennials, in particular, are 2X more likely to be attentive to video on mobile than on TV. In addition, mobile app publishers can leverage consistent identifiers to boost CPMs by allowing advertisers to leverage their own data in transactions to target the users they want to reach. Share your thoughts and/or resources in the comments below! Check out the rest of the insights we heard today on the #AFtalks hashtag. Huge thanks to Allen and to all those that were part of today’s discussion! Join us for our weekly Twitter chat every Tuesday at 2pm ET (bring your friends!). See you all next week!